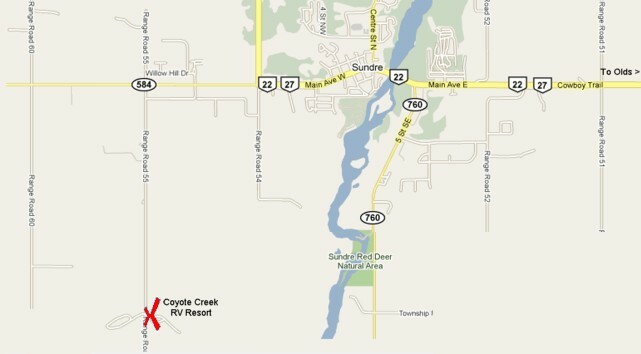 The RV resort is located 3.3 kms west and 3.3 kms south of the town of Sundre, Alberta. Sundre is located approximately 40 kms west of Olds, about an hour from Calgary or Red Deer. From Calgary, go north on Hwy 2 (QEII/Deerfoot Trail). Turn west onto Highway 27 (towards Olds/Sundre). Turn south on Range Road 55 and follow the signs. From Edmonton/Red Deer, go south on Hwy 2 (QEII).